Ice Park Executive Director Dan Chehayl is no stranger to the Ouray Ice Park. This is his eighth season working here, beginning as an ice farmer and graduating to Park Manager and Director of Operations before assuming his current position. Chehayl first came to the Ouray Ice Park as a college sophomore with a group of friends from Sterling College in Vermont. He came back as often as he could over the next couple of years and eventually moved to Ouray in 2007. That first winter, he worked at Mouses Chocolates and ice climbed obsessively. Then, after a year in Telluride and a brief stint back east, he came back to Ouray for good, winning a job as an ice farmer with former Ice Park Manager Kevin Koprek. Chehayl wears many hats at the Park, from overseeing the ingenious plumbing system and the staff that maintain it, facilitating the annual Ouray Ice Festival, to securing funding for the annual budget. One of Dan’s favorite things about working for the Ouray Ice Park is watching the transformations of the gorge throughout the winter. “It’s like the cliffs in the gorge come to life; every day is magical out here in the park!” he said. Born and raised in Ouray, Logan began climbing at a young age, experiencing all the San Juan's and it's surrounding environs has to offer while developing himself into a gifted climber. He has competed in Ouray's elite mixed climbing comp three times and at Vail's Teva mountain games as well, often as the youngest competitor in the league. Logan has transferred his climbing skills to other aspects of his life as well, most notably as a climbing coach for the Ridgway/Ouray climbing team, and as a foreman of a Midwest tower crew for the past several years. Recently he founded a local company, Red Mountain Riders, already well known for manufacturing high quality handcrafted longboards. Logan is joining us for his fifth year at the Park. Born and raised in the corn fields of northwest Indiana, Xander first explored Ouray in 2010 on a road trip through Colorado. It was here in the shadow of the San Juans that the seed was planted for many more journeys westbound. After scrapping together a mechanical engineering degree in 2012, he threw a sleeping bag in his car and set out for the mountains. The next few years were painted with a mosaic of nomadic brush strokes, until shelving the prospect of an engineering career and moving to Ouray in 2015. Since then, Xander has focused his energy on a different side of life - one full of white velvet mountains, rusty desert canyons, and two worn out soles. Xander is joining us for his fourth year at the Park. Lucas moved to Ouray in August 2014 after finishing his fourth summer working for a nonprofit pack outfit in the Sierra Nevada backcountry. It was there that he developed a love for mountain life and climbing. Lucas swung his first ice tools in New Hampshire, and further developed his climbing skills on rock and ice in Ouray and the deserts of southeastern Utah. His favorite ice climbs are La Ventana in the Ouray Ice Park’s Five Fingers climbing area, and Whorehouse Hoses in Eureka. Lucas is joining us for his third year at the Park. After years of intermittent work weaved with nomadic tendencies chasing rocks and sunsets, Justin has made base camp here in southwest Colorado. His journey began in the Front Range, where he discovered the freedom of the hills as a teenager. It didn’t take long before stories of deeper canyons and higher summits lured him further west, and places like Indian Creek and the Winds soon became seasonal homes. A chance encounter involving a sticker-plastered Subaru, a note on the windshield, and a complete stranger led Justin to a wintery Ouray for the first time 5 years ago. Since then, he's found much more than just frozen water in this tiny box canyon - he’s found his community, his family, and his new home. Justin is joining us for his third year at the Park. Andrew moved to Ouray after traveling the world and following summer for 8 years. His international travels were focused on his professional passion for canyoning/canyoneering, and landed him in places such as New Zealand, Switzerland, Japan, and Indonesia. He and his wife came to Ouray in 2016 to start their canyoning-focused guiding business, Canyoning Colorado, and to settle down and start a home. 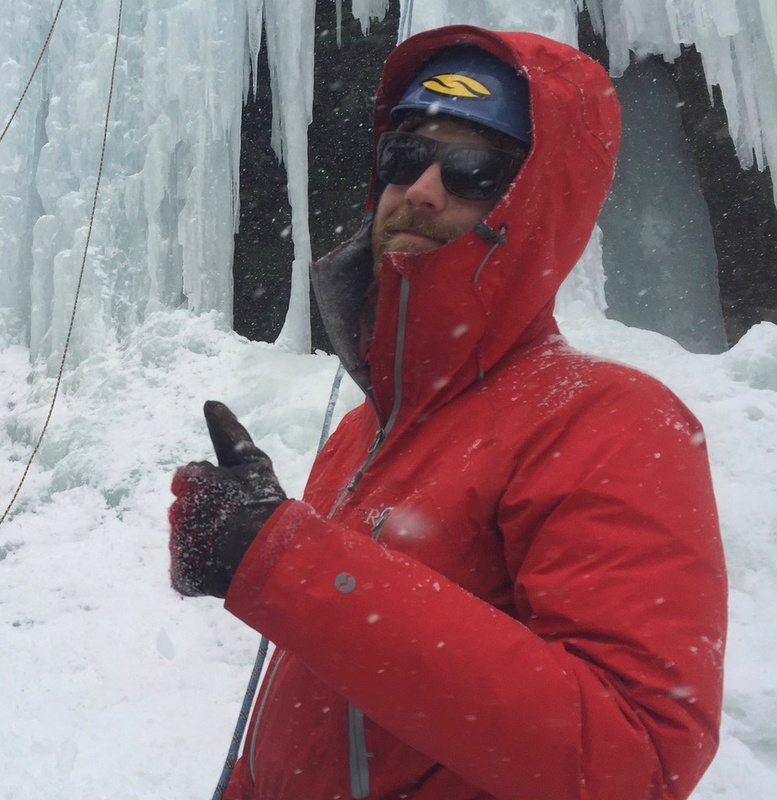 Ice climbing quickly became a necessity in Andrew's life, since he needed a winter sport! A life-long rock climber and a lover of all things ropes-related, his transition to ice has been natural. Andrew is joining us for his second year at the Park. Tres learned to climb ice in Ouray during a spring break in college. Since he first climbed in the Park years ago, he’s developed a passion for ice climbing. In recent years, Tres has lived in many different places working a number of different jobs in the outdoor industry. His experiences range from leading backcountry trips with Chicago’s inner-city youth, working with traumatized adolescents at a wilderness therapy program, leading extended backpacking expeditions in Alaska’s Brooks Range and most recently working as a Guide in Zion National Park. When he’s not working, he loves to climb, ski, travel, cook and explore. Since first visiting Ouray years ago, he’s climbed ice all over the Midwest and is thrilled to now call the San Juan’s his home. Tres is joining us for his first year at the Park. Mairi grew up in London; she left the UK ten years ago to live, work and travel all over the world. During this period Mairi worked for various outdoor operators, before launching Canyoning Colorado, in Ouray with her husband. This season, Mairi joined the team at the Ouray Ice Park as the Administrative Coordinator. In addition to working behind the scenes in office roles, Mairi is a 500 hour Registered Yoga Teacher and her passion for yoga as a lifestyle continues to expand her practice and teachings. Prior to joining the team, Mairi studied in India and you can join her weekly yoga classes in Ouray at Elevate Wellness Spa.